The City of Ottawa has suspended demolition and building permit fees for those residents affected by the tornadoes of Friday, September 21, 2018. The suspension of fees include the Permit to Demolish, Permit to Construct, Applications for Access to Building Permit Records, Fees for 9-1-1 Replacement Blade Signs and Sewer Permit Fees for affected residents. My home has been damaged as a result of the tornado. When is a Building Permit required for the associated repairs? Deformation or deflection of structure. Removal, repair or replacement of structural framing, including trusses, rafters, support posts, piers, beams and joists. If you are unclear whether or not a Building Permit is required to address your specific scenario, please contact Building Code Services. My home has been damaged due to the tornado. Are there any scenarios not requiring a Building Permit for the associated repairs? Removal of drywall or other interior finish. Replacement of windows or doors one-for-one in the same location and size. Replacement of cladding (siding, brick, etc. ), deck boards or shingles. Reinstalling displaced exterior stairs, landings or decks that are less than 1.2 metres (approx. 4 feet) in height from grade. Reinstalling displaced accessory buildings such as sheds that are less than 10 square metres (approx. 108 square feet) in area. Repairs to sheathing and shingles. There are many other repairs that may be undertaken without requiring a Building Permit. If you are unclear whether or not a Building Permit is required to address your specific scenario, please contact Building Code Services. A Building Permit may be obtained by visiting any Building Code Client Service Centre. My home is showing signs of structural damage as a result of the tornado. What should I do? If structural damage is suspected, it is recommended that you contact a suitably qualified professional (such as a professional engineer) to assess the situation and provide direction on the required repairs. Please contact Building Code Services for more information on how to proceed if structural damage is suspected. A Building Permit may be obtained by visiting any Building Code Client Service Centre. For information regarding processing, submission details, forms etc., please contact Building Code Services or visit our website. Does the City of Ottawa have copies of construction plans for my home? Depending on the age of the home and its location, the City of Ottawa may have copies of the plans for the original construction and/or subsequent renovations. Copies of these plans may be viewed through the Access to Building Permit Records process. Please contact Building Code Services for more information, or visit our website. Please note that some older Building Permit information may take several days to retrieve. Do I need a building permit to reconstruct detached structures on my property? A Building Permit is required for construction of any structure occupying a space larger than 10 square metres (approx. 108 square feet) in area. This includes reconstructing an existing structure. How much time do I have to begin rebuilding structures on my property? Buildings that have been damaged as a result of the tornado are not necessarily subject to a timeline for reconstruction, however access to severely damaged structures must be reasonably restricted in order to ensure safety. Please contact Building Code Services for more information if you have severely damaged structures on your property. Can I rebuild my home on its existing foundation? An existing foundation may be used when rebuilding a house provided the foundation is in good condition and capable of supporting the imposed loads. A professional engineer may be required to confirm if reuse of the existing foundation is appropriate. Why do I need a Building Permit? What happens if I don’t get one? By authority of the Building Code Act, a property owner is required to obtain a Permit prior to construction or renovation. Obtaining a Building Permit ensures that the minimum standards for health and safety, fire protection, structural adequacy, energy performance, and accessibility are met. Failure to obtain a Building Permit for construction may result in enforcement under the authority of the Building Code Act and, in the case of a building failure or loss, insurance coverages may be void. Do I need a Building Permit if my front porch was damaged? A Building Permit is required for the structural repair of buildings, including their associated porches, roofs, sunrooms, additions and decks. Please contact Building Code Services if it is unclear whether or not a Building Permit is required for your project. How do I arrange for a Building Inspector to attend my property for an inspection? Please contact Building Code Services to discuss your specific situation and arrange for your inspection. How quickly can an Inspector attend my home or business for an Inspection? Building Code Services will make every effort to attend to your home or business as promptly as possible. Inspections will be scheduled within one business day following a request, however priority will be given to properties where tornado damage has compromised the structural integrity of dwellings. Where can I find information on construction fencing? Construction Fencing must be provided to enclose the area where existing buildings have been significantly damaged, are unsecured and may cause a public safety risk. This includes open pools, hot tubs and outbuildings. LOCATION OF FENCING: The fence must be structurally sound and fully surround all of the site’s activities. HEIGHT OF FENCING: When the site is located 3.0 metres or less from a public pathway or where the public congregates, the fence must be at least 1.8 metres high measured from grade outside of the enclosure. The fence height may be reduced to a minimum of 1.2 metres high only if the activity involves a residential building of no more than 3 storeys and is also located more than 3.0 metres from an adjacent public walkway. large lots in the rural areas where the neighbouring properties are sufficiently far apart, and the public does not have any reason to frequent the site. where the openings into the building are secure when the site is not attended. For all other Building Code Services inquiries, please call 3-1-1. Under the Building Code Act, a building permit is required for the construction of a new building, an addition, or alteration of any building or structure with a building area of over 10 square metres (approximately 108 square feet). The following list provides examples of common projects that require building permits. If the scope of your project does not appear on the list below or you are unsure of the permit requirements please contact Building Code Client Service Centre or 3-1-1 for more information. If the scope of your project does not appear on the list above or you are unsure of the permit requirements please contact Building Code Client Service Centre or 3-1-1 for more information. You can also email buildingpermits@ottawa.ca. Adding a single, self-contained rental apartment to your home provides your family with an additional source of income and provides your community (or a member of your family) with another source of affordable housing. These apartments – technically called secondary dwelling units – are regulated by the Zoning By-law. If you are adding and/or building a unit in an existing dwelling, you need a building permit before proceeding. The construction may include alterations of existing walls, enlarging any window, adding a new exterior door or an internal shared entrance, or even include an addition however, even if there is limited or no work proposed, the proposed “Change of Use” must be reviewed to ensure compliance with the provisions of the Ontario Building Code and other applicable law. No more than an amount equal to 40 per cent of the gross floor area of the principal dwelling may be developed for a secondary dwelling unit, except where a basement unit is created, in which case, there is no maximum size. The new unit must have a separate access on the ground floor of a principal dwelling (unless building or fire codes allow something else). However, the separate access is not allowed in an exterior wall facing the front yard. An internal shared lobby or entrance hall with a common entrance in the exterior wall facing the front yard is permitted. A maximum of one unit is permitted in a detached dwelling, one in each half of a semi-detached building and only one for the whole of a duplex dwelling. The new unit must be on the same lot as the principal dwelling unit and must not change the streetscape character along the road on which it is located. No additional parking space is required but where a new one is provided, it cannot be located in the front yard. Tandem parking in the existing driveway is permitted. Secondary dwelling units are not permitted in the former Village of Rockcliffe Park. Also, secondary dwelling units are not allowed in duplex dwellings in the Queensway Terrace North neighbourhood. Your property taxes, as determined by the Municipal Property Assessment Corporation, may change as a result of adding a secondary dwelling unit in your home. Rent counts as additional income under the Income Tax Act, so adding a secondary dwelling unit will affect your income taxes. Notify your insurance company or broker as early as possible about your plan to build a secondary dwelling unit. Your policy may need to be adjusted to reflect the changes in liability and the adjusted value of your home after the addition is completed. Financial assistance is available through the Canada Mortgage and Housing Corporation’s Homeowner Residential Rehabilitation Assistance Program for certain secondary dwelling units. At key stages of building construction, your work must be inspected to ensure that the applicable stage of completed construction complies with the Ontario Building Code. The permit plans and specifications must be on site and made available to the Building Inspector at the time of inspection. To ensure the availability of a Building Inspector, you should book inspections 48 hours in advance. The Building Inspector's name and phone number are identified on the building permit. Failure to have the appropriate inspection performed may result in your having to uncover and expose the work for inspection, or other Orders issued etc. A Development Information Officer (DIO) can advise on zoning regulations impacting your accessory building design such as setbacks to lot lines, building height and lot coverage. Secondary Dwelling units in accessory structures, termed Coach Houses in the City of Ottawa, were approved by Council on October 26, 2016. A Coach House means: A separate dwelling unit that is subsidiary to and located on the same lot as an associated principal dwelling unit, but is contained in its own building that may also contain uses accessory to the principal dwelling. These new housing units are permitted in Ottawa's urban, suburban and rural areas subject to Section 3.1 of the Official Plan and Section 142 of the Zoning By-law. The City has created a document, titled: How to Plan Your Coach House in Ottawa [ PDF 9.927 MB ] . This document helps to understand the process and costs associated with building a coach house. This guide also provides answers to many questions associated with constructing a coach house. If you are adding or retrofitting an existing accessory structure to create a Coach House, you need a building permit before proceeding. For the urban area, the coach house must have servicing from the primary homes municipal water and sewer connection and for lots in the rural area with private servicing they must first proceed with a Site Plan Control Application to confirm on site water suitability for the Coach House before applying for a building permit application. Only lots with a single family dwelling, semi-detached dwelling, duplex dwelling or in certain circumstances a townhome (which has road frontage on two public roads or a laneway and a road) are permitted to apply for a Coach House. Lots which already have a Secondary Dwelling Unit (separate apartment) within the primary residence, a garden suite or rooming units, do not qualify to build a Coach House. There are maximum unit size restrictions for the urban and rural area which are tied to the size of your lot and the size of your principle dwelling unit, as detailed in Section 142 of the Zoning By-law. No additional parking is required, but where provided it must meet the related parking Zoning By-law provisions. Parking in tandem in the existing driveway is permitted. Your property taxes, as determined by the Municipal Property Assessment Corporation, may change as a result of adding a coach house in your home. Rent counts as additional income under the Income Tax Act, so adding a coach house will affect your income taxes. Notify your insurance company or broker as early as possible about your plan to build a coach house. Your policy may need to be adjusted to reflect the changes in liability and the adjusted value of your home after the addition is completed. Note: only the transit portion of a development charge applies to a coach house. To find your applicable fee, you need to find your area (for example inside the greenbelt, outside the greenbelt, rural serviced or rural unserviced) and then select the fee that corresponds to the size of your coach house (for example a one bedroom apartment or a two + bedroom apartment). A number of City processes must be completed before starting construction of a coach house. In all circumstances, a building permit is required. There may also be situations that require a Site Plan Control application and/or a Committee of Adjustment Minor Variance application. These processes are described in more detail below. All applications require a building permit. Should the homeowner move forward with building a coach house, all building permit applicants must arrange for a service consultation meeting prior to applying for a building permit by calling 3-1-1 and asking to speak to the Building Code Services office assigned to your property address. All applications that have a private septic system and well are required to apply for a Site Plan Control application. Site Plan Control applicants must arrange for a Pre-Application Consultation Meeting with City Planning Staff by calling 3-1-1 and asking to speak to the Development Review, Rural Services, or by going to ottawa.ca and searching "information for development applications". Site Location: The proposed amendments will affect residential lands City wide. The proposed amendments are housekeeping items that clarify the intent of the recently-approved Coach House policy and zoning frameworks and associated provisions. A number of issues with the implementing Site Plan Control By-law, Official Plan policy and Zoning By-law performance standards have come to the City’s attention and require clarification. The proposed amendments will adjust a number of policies and implementing provisions to reflect the intended coach house residential permissions and apply them to residential lands city-wide. The proposed Site Plan Control By-law amendment will adjust an existing clause within Section 5 of the Site Plan Control By-law to allow Coach Houses to proceed without needing a Site Plan Control application where a lot has a municipal service connection. The proposed amendment addresses this clarification issue that has come to the City’s attention since the Coach House package was approved. A coach house, where the coach house is connected to public or communal water and wastewater services. Amend this clause so as to not require any lot with a municipal water connection to go through a Site Plan Control application. The intent of the Site Plan Control requirement is to require lots in the rural area which have private servicing to obtain City review and approval of the water quality and quantity before proceeding to the building permit application. Where a lot has municipal water, this planning process is not needed. The proposed Official Plan amendments adjust existing policy in Section 3.1 of the Official Plan to allow Coach Houses as an appropriate form of secondary infill housing. The proposed amendments address three clarification issues that have come to the City’s attention since the Coach House package was approved. A coach house in conjunction with a townhouse dwelling will only be permitted where the lot containing the townhouse has direct frontage on two public streets, or on a public street and a travelled public lane. A lot that is 0.8 ha or greater in size and is located in the rural area or village and where: (i) the primary dwelling is serviced by a private water and wastewater system and the coach house will share either the water or wastewater system with the main dwelling; or (ii) the primary dwelling is serviced by one public or communal service (water or wastewater) and one private service, and the coach house will share the public or communal service with the main dwelling; (d) A coach house serviced in accordance with c.ii. will be subject to site plan control. Amend this policy to allow rural lots that have municipal water service to not require a rural Site Plan Control application. The purpose of the rural Site Plan Control is to confirm that the onsite water quality and quantity is sufficient for the primary home and the coach house. Where municipal water is provided, this planning process step is not required. The Zoning By-law will limit the coach house to a height of one storey for lots in the urban area. An application to allow a height of up to two storeys through a minor variance may be considered where, in addition to the considerations noted in h. above, the coach house is proposed to contain all of its habitable space above a garage. Amend this policy to allow two-storey coach houses to contain habitable space on the main level. Where a two-storey coach house is provided, maintain the requirement that a garage is required on the main level, however additional habitable space may be included on the main level within the footprint of the structure. The proposed Zoning By-law amendments adjust existing performance standards within Section 142 of the Zoning By-law to allow Coach Houses as an appropriate form of secondary infill housing. The proposed amendments address clarification issues that have come to the City’s attention since the Coach house package was approved. Clarify that a coach house in the rural area on lots that are 0.8 hectares or larger may locate anywhere on the lot, provided the unit meets minimum setbacks, and not be restricted to the rear yard. This proposed amendment addresses the reality that larger rural lots are configured differently than smaller urban lots and a coach house could locate in a variety of spots on the lot. In most circumstances the location of the new coach house will be restricted based on the existing and proposed locations of the private services. Allowing the coach house to locate anywhere on a rural lot that is 0.8 hectares or larger addresses these varying needs. Further, the intent of this provision is most applicable to the urban area, where community character is being protected. Larger rural lots have the ability to locate coach houses without affecting community character. Clarify that a coach house on a townhouse dwelling lot must only provide direct pedestrian access from the coach house to a public street and will not require direct access to two public roads. This proposed amendment builds on the above proposed Official Plan amendment. The current Zoning By-law provision is worded to prohibit any end unit townhouse dwelling from being permitted a coach house, where it does not have access to two public streets or a public street and a rear lane. There are several scenarios that have come to the attention of the Planning, Infrastructure and Economic Development Department where large end unit townhouse lots exist, which can provide direct pedestrian access from the new backyard coach house unit to a public street, however do not have access to two public streets to meet the qualification provision. Clarify the maximum permitted size of a coach house when paired with an accessory use. The current Zoning By-law provision is worded to require any future one-storey coach house that contains an accessory use within the footprint of the same building, to be counted toward the maximum permitted size. It is not the intent of the maximum permitted coach house size to include an accessory use to the principal dwelling unit. Accessory uses are regulated by the Section 55 of the Zoning By-law and Section 142, provision 10 provides further maximum yard coverage’s for both the rural and the urban area. The proposed clarification will exclude an accessory use for the primary dwelling from being included in the maximum permitted coach house size calculation. Adjust the maximum wall height provision in the urban area. The current coach house maximum height provisions for properties in the urban area includes a maximum wall height, this provision requires amendment as it does not work for any roof type except a flat roof. For example if the following roof types: gable, mansard, gambrel and shed roof, were built to the maximum permitted height of 3.6 metres, measured to the mid-roof line, it results in two elevations having a wall the extends from the ground to the highest peak in the roof thus exceeding the current maximum permitted wall height of 3.2 metres on these two walls. These roof types would therefore be in contradiction with the current Zoning By-law provision as written, or the proposed building would have to have an outermost wall height that is significantly lower than 3.2 metres. A lower interior wall height than 3.2 metres was not the intent of the provision and would significantly affect the construction practices and livability of the coach home interior. However, the intent remains to restrict non-peak walls to 3.2 m in height and the new zoning provision will clarify this. Remove the application of a maximum setback in the rural area. The current setbacks for the rear yard and/or interior side yard include a maximum setback of 1 metre where no windows are proposed on a wall that faces the interior or rear lot line. This provision is appropriate for the urban area where lots are small, however in the rural area there should be flexibility for the rear and interior setbacks of a coach house. Clarify the driveway permissions to allow a driveway to extend to a coach house. Currently the extension of an existing driveway to a coach house is not permitted. Clarify this permission to allow an existing driveway to be extended, within its width, toward a coach house. Agricultural and Rural Affairs Committee – May 4, 2017. Please contact the undersigned planner. If you wish to be notified of the adoption of the proposed Official Plan and Zoning By-law amendments, or of the refusal of a request to amend the official plan, you must make a written request (i.e., return the attached comment sheet) to the City of Ottawa. If a person or public body does not make oral submissions at a public meeting or make written submissions to the City of Ottawa before the proposed Official Plan and/or Zoning By-law amendments are adopted, the person or public body may not be added as a party to the hearing of an appeal before the Ontario Municipal Board unless, in the opinion of the Board, there are reasonable grounds to add the person or public body as a party. Please provide any comments to the undersigned planner by March 16, 2017. Applications that cannot meet the Zoning By-law performance standards must be redesigned to comply. In cases where circumstances peculiar to a property prevent you from developing your coach house in a way that strictly conforms to the Zoning By-law, you may apply to the Committee of Adjustment for a minor variance. Minor variance applicants should arrange for a Pre-Application Consultation Meeting with City Planning Staff by calling 3-1-1 and asking to speak to a planner in the Planning Infrastructure and Economic Development Branch. More information on a minor variance with the Committee of Adjustment can be found on ottawa.ca. For further information on Coach Houses or how one can be built on your property call the City of Ottawa help line at 3-1-1 and ask to speak to a Development Information Officer (for pre-planning questions) or a Building Code Client Service Representative (for building permit related questions). Under the Building Code Act, a building permit is required for the construction of a new building, an addition, or alteration of any building or structure with a building area of over 10 square metres (approximately 108 square feet). The Ontario Building Code outlines the minimum requirements for various elements, such as framing and foundation requirements, and can be viewed on the Ontario Ministry of Municipal Affairs and Housing website. A truss layout as supplied from the manufacturer may be required, depending on the complexity of pre-engineered roof trusses. The joist layout as supplied from the manufacturer is required when pre-engineered joists are used. At key stages of building construction, your work must be inspected to ensure that the completed construction complies with the Ontario Building Code. The permit plans and specifications must be on site and made available to the Building Inspector at the time of inspection. To ensure the availability of a Building Inspector, you should book inspections 48 hours in advance. Failure to have the appropriate inspection performed may result in your having to uncover and expose the work for inspection, or other Orders issued, etc. The Building Inspector's name and phone number are identified on the building permit. For a list of required inspections that may apply based on the proposed addition, please refer to the table below. Excavation Required prior to placement of concrete footings. The geotechnical soils report confirming soil-bearing capacity may be requested by the Building Inspector, if warranted by on site soil conditions. Foundation Required prior to backfill of foundation. Framing and Mechanical Rough-In Required at completion of structural framing, stairs, including components of fire separation and fire stopping. Completion of rough-in for electrical system, fireplace, ductwork for heating, ventilation and air conditioning. Exterior of building must be weather proofed. Insulation/Vapour Barrier Required at completion of insulation, air barrier and vapour barrier installation. Occupancy A person may occupy a dwelling provided that an Occupancy Permit has been issued by the Building Inspector. To be eligible there must be no outstanding Building Code Orders and certain building components and systems must be complete and inspected under Division C 1.3.3. Final Inspection Required at completion of the building. A Development Information Officer (DIO) can advise on zoning regulations impacting your addition design; such as setbacks to lot lines, lot coverage, and building height. Please call 3-1-1 for assistance. For an overall description of Public Works-Environmental Services’ Backflow Prevention Program and prior to applying for a building permit please refer to Backflow Prevention Program or email backflow@ottawa.ca. Are you the owner of an existing building who is now required to install a new backflow assembly, relocate a working assembly or replace a defective assembly? If so, you must apply and obtain a building permit before starting any work on the plumbing system. Your Building Inspector must confirm that the new or relocated Backflow Assembly complies with the requirements of the Ontario Building Code and the referenced standard, CSA B64.10-11 for Premise Isolation. Additionally, the Inspector must verify the device has passed testing by a Qualified Tester as described in the amended Water By-law. The permit plans and specifications must be on site and made available to the Building Inspector at the time of inspection. To ensure the availability of a Building Inspector, you should book your inspection 48 hours in advance. The Building Inspector name and phone number is identified on the building permit. All new single, semi detached, row house and townhome dwelling units in the City of Ottawa require the installation of backwater valves (BWVs) on sanitary service laterals (sanitary building drains). The requirement for additional protection against sanitary sewer back-ups (back flooding) was introduced after many homes to experienced basement backups due to surcharging of sewer systems during significant rainfall events. A comprehensive review of storm and sanitary service BWVs was undertaken at the request of City Council. Report ACS2010-ICS-INF-006, item 2, approved by Council, which recommended expanding the Installation of BWVs by amending the sewer design guidelines per Technical Bulletin ISD-2010-1to include mandatory installation of BWVs on sanitary services for new home construction. Your Building Inspector must confirm that a normally open BWV is installed on the Sanitary Building Drain for each dwelling unit in accordance with Ontario Building Code, Division B, section 7.4.6.4.2(a)(b) and the referenced CAN/CSA standards. The BWV must be located within the dwelling unit and accessible for inspection and maintenance purposes. Where applicable, the inspection of the sanitary BWV installation may be combined with the existing inspection practice for the storm BWV which occurs at underground plumbing rough-in and final interior inspection stages. Regardless of the deck’s walking surface area, if the deck is adjacent to or attached to the house and its walking surface is more than 600 mm (24 in.) above the adjacent grade, a permit is required. Regardless of the deck’s walking surface area, if the deck is an elevated deck providing principal access to a building a permit is required. If the deck is independent from the house (eg. is in the middle of the yard) and has a walking surface greater than 10 square metres (approximately 108 square feet) in area and its walking surface is more than 600 mm (24 in.) above the adjacent grade, a permit is required. The Ontario Building Code outlines the minimum requirements for various elements, such as joist size, beam size, foundation requirements, guard requirements, and can be viewed on the Ontario Ministry of Municipal Affairs and Housing website. The Building Inspector's name and phone number are identified on the building permit. For a list of required inspections that may apply based on the proposed sundeck, please refer to the following table. Excavation/Foundations Footing and Foundation – For in-situ piers and pads prior to backfill, the Building Inspector will confirm that the foundation system is constructed as per the Ontario Building Code and permit plans. Framing Required at completion of structural framing and guards. Final Required at completion of the deck framing, stairs and guards. A Development Information Officer (DIO) can advise on zoning regulations impacting your sundeck design; particularly set backs to lot lines. Please call 3-1-1 for assistance. You need to obtain a building permit to relocate or demolish an existing building or structure. Your demolition application will be reviewed to ensure compliance with applicable law, including the Ontario Heritage Act, the Zoning By-law and in some areas, the Demolition Control By-law. The review will also identify any legislative or safety requirements that may need to be adhered to during or after the demolition of the structure. Clearance authorization from utilities confirming services have been appropriately disconnected or capped must be obtained as well.. The demolition of certain building types (silos, and barns) and non-load bearing interior partitions does not require a demolition permit. Any person who commences demolition prior to the issuance of a Permit to Demolish shall, in addition to any other penalty imposed under the Act or Building Code, pay a non-refundable administrative surcharge fee as set out in Schedule "A" of the City of Ottawa, Building By-law 2014-220. It is the responsibility of the owner to ensure that the appropriate Encroachment Permit is obtained prior to undertaking a demolition requiring the use of the City road allowance in order to store materials and/or stage the work. Please call 613-580-2424, extension 16000 – Right of Way Permits and Applications Section. Abandonment of a well shall be done in accordance with the Ontario Well Water Regulation #903. You can print a copy of the regulation from ServiceOntario’s www.e-laws.gov.on.ca. For more information, call the Ministry of Environment Public Information Centre at 1-800-565-4923. Abandoning a septic system requires pumping out of the tank, filling it with sand and capping it. 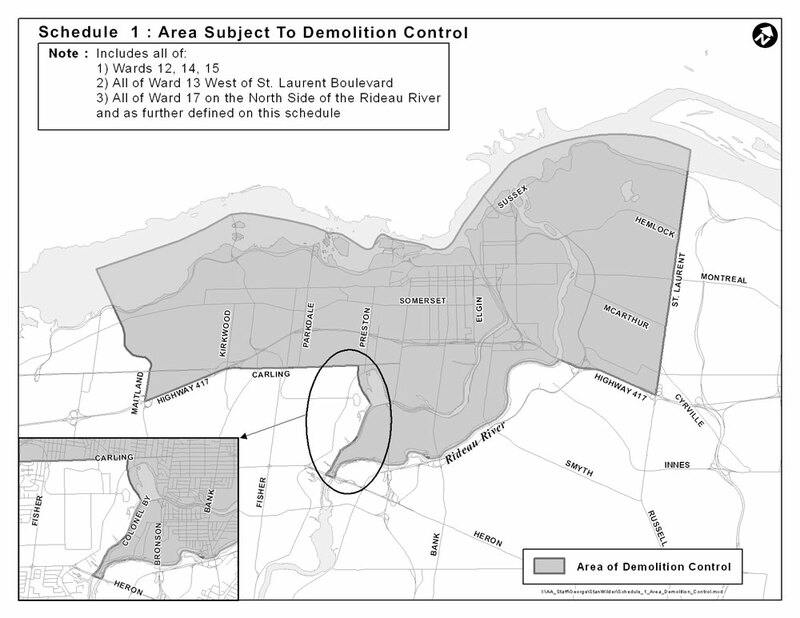 Where the building to be demolished is located within the Area of Demolition Control as defined in the attached Schedule 1 and includes the demolition of a residential unit and no replacement building permit has been issued, Demolition Control approval from the Planning and Growth Management Department is necessary. As well, Demolition Control approval will be required if the building is designated under Part IV or Part V of the Ontario Heritage Act. Application forms are available at all Client Service Centres or online, together with the requirements for submissions. Before making an application, you should discuss your proposal with Planning and Growth Management Branch staff. Tax adjustments are not automatic. You must apply for a property tax adjustment after the demolition has occurred. Applications must be filed with the City prior to February 28th of the year following the year of demolition. For details regarding the application process please refer to cancellation, reduction or refunds of property or call 613-580-2444. Section 357 of the Municipal Act provides the authority by which to apply for an adjustment of property taxes after a demolition has occurred. A municipal redevelopment credit may be available if demolition of an existing structure occurs within 10 years of the issuance of a building permit for a new building. After this period, no credit is possible. The time limit was set at 10 years with the enactment of the City's 2014 development charges by-law (Section 9 Redevelopment of Land Credits). Beginning January 1, 2019, the time limit will be limited to development that occurs within a five year period. Thus someone who demolished a building on or before December 31, 2013 will have no entitlement to a credit as of January 1, 2019. Inspections are an integral part of the permit process and are required at commencement of demolition. Contact your Building Inspector after issuance of the building permit to schedule your inspections. The contact information for the Building Inspector will be noted on the building permit. To ensure the availability of a Building Inspector, you should book inspections 48 hours in advance. Have the permit, plans and specs available for the Building Inspector to review. Construction of an accessory building (detached garages and garden sheds), including pre-fabricated buildings, occupying an area greater than 10 square metres (108 square feet) requires a building permit. The Ontario Building Code outlines the minimum requirements for various elements, such as framing and foundation, and can be viewed on the Ontario Ministry of Municipal Affairs and Housing website. The Building Inspector's name and phone number are identified on the building permit. For a list of required inspections that may apply based on the proposed accessory building, please refer to the table on the next page. Excavation Required prior to placement of concrete footings. Framing and Mechanical Rough-In Required at completion of structural framing, and is satisfactory as required by the Ontario Building Code. Occupancy Inspection to confirm minimum Ontario Building Code requirements prior to occupying the space. Final Required at completion of the building. Final Occupancy Permit for a fully completed building will be issued by the Building Official. If you plan to establish a new driveway, widen or close your driveway, you need to apply for a Private Approach Permit. Private Approach Permit applications are available at Client Service Centres and online. The Ontario Building Code outlines the minimum requirements for various elements, such as framing and materials, and can be viewed on the Ontario Ministry of Municipal Affairs and Housing website. The building Building Inspector's name and phone number are identified on the building permit. For a list of required inspections that may apply based on the proposed finished basement, please refer to the table below. Framing Required at completion of structural framing. Insulation/Vapour Barrier Required at completion of insulation and vapour barrier installation. Plumbing – Final Required at completion of plumbing system, fixtures and appliances. Final Required at completion of the basement’s alterations. The Ontario Building Code outlines minimum requirements for various elements, these can be viewed on the Ontario Ministry of Municipal Affairs and Housing website. At key stages of building construction, your work must be inspected to ensure that the completed construction complies with the Ontario Building Code. The permit plans and specifications must be on site and made available to the Building Inspector at the time of inspection. To ensure the availability of a Building Inspector, you should book inspections 48 hours in advance. Failure to have the appropriate inspection performed may result in your having to uncover and expose the work for inspection, or other Orders issued etc. The Building Inspector's name and phone number are identified on the building permit. The Ottawa Septic System Office(OSSO) of the Rideau Valley Conservation Authority coordinates the review and approval of any septic system installed, altered or repaired, anywhere in Ottawa. Pick up an information package (which includes the required application forms) from OSSO, or from the City's Client Service Centres. Refer to the Ottawa Septic System Office's website for fees, to download application forms and for more information. A building permit to install solar collector systems with a face area equal to or greater than 5 m² on any building except as provided below. Solar collectors consist of either photovoltaic systems used in the production of electricity or solar thermal collectors used for air or water. “Face area” of a collector system is considered the aggregate area of all panels or modules, either in a series or an array, mounted on a building. A building permit is required to ensure that the building is capable of supporting the additional weight of the panels and connection systems, wind and applicable snow loads. The design of solar collector systems and the on-site field review of their installation must be undertaken by a professional engineer licensed in the Province of Ontario. the existing roof has been assessed by a Professional Engineer licensed in the Province of Ontario and is deemed to be in good structural condition, without deterioration, missing or broken members and is capable of supporting the panels and connection system in all directions including the additional weight of the solar panels, wind loads and snow loads as applicable. Although a building permit may not be required it is important to ensure that the solar panels are installed using a pre-engineered fixed connection racking system in compliance with the manufacturer’s installation instructions for the specific use and roof type and that the installation is reviewed by a professional engineer. Steps should be taken to reduce the uncontrolled sliding of snow and ice from panels in close proximity to roof edges. Panels may be flush-mounted using brackets or racks that attach directly into the wall or roof framing system. Angled supporting systems may also be utilized to further optimize the orientation of the panel to the sun using engineered racking structures. Elevated racking systems may also be used on flat or low-slope roofs attached to the roof using fixed or ballast connections. The building permit fee is based on valuation of the proposed construction, which includes the total cost of all materials, labour, equipment, overhead and related services (ie. design and consulting services) assigned to the supply and installation of the system and any building modifications. When the installation is complete, then your work must be inspected to ensure that the construction complies with the Ontario Building Code. The permit plans and specifications must be on site and made available to the Building Inspector at the time of inspection. To ensure the availability of a Building Inspector, you should book your inspection 48 hours in advance. The Building Inspector name and phone number is identified on the building permit. Failure to have the appropriate inspection performed may result in Orders issued. A Development Information Officer (DIO) can advise on zoning regulations impacting your addition design; such as setbacks to lot lines, lot coverage, and building height. The Ontario Building Code distinguishes between Solar Domestic Hot Water (SDHW) systems that are factory-packaged and non-packaged systems. A factory-packaged SDHW system generally consists of a complete series of assembled components which provide solar pre-heated water to a domestic hot water storage tank through the use of solar thermal collectors, heat transfer exchangers (utilizing a liquid heat transfer media and potable water) and includes all appropriate plumbing and electrical controls to affect the transfer. Non-packaged systems refer to the series of individual components that make up a SDHW system not specifically produced to be used in a proprietary system. A professional engineer licensed in the Province of Ontario must certify that the proposed non-packaged SDHW system conforms with the intent of CSA F379.1-09, the referenced standards applicable to SDHW components listed in Table 1 of the standard and the intent of the requirements for SDHW systems in the Ontario Building Code. Building permit submission documents must include a statement of compliance to the above reference documents. Packaged SDHW systems in possession of a Certificate of Compliance from CSA International in accordance with CSA F379.1-09, Solar Domestic Hot Water Systems (liquid-to-liquid heat transfer) are exempt from the requirements above. Installation of the system must be undertaken by a qualified installer certified by the Canadian Solar Energy Industry Association. As an interim measure to obtaining installer certification from CANsia the installation must comply with item 2 below. Compliance of the installation to “good engineering practice” must be confirmed by a professional engineer licensed in the Province of Ontario. When the installation is complete, your work must be inspected to ensure that the construction complies with the Ontario Building Code. The permit plans and specifications must be on site and made available to the Building Inspector at the time of inspection. To ensure the availability of a Building Inspector, you should book your inspection 48 hours in advance. The Building Inspector name and phone number is identified on the building permit. Failure to have the appropriate inspection performed may result in Orders issued. Some projects are exempted from having to obtain a building permit, however, your project must still comply with the Ontario Building Code and any applicable law, such as the Zoning By-law. A detached accessory structure (gazebo, tool shed, etc.) that measures less than 10 square metres (approx.108 square feet) does not require a building permit. Designated Heritage Buildings or buildings located within a Heritage District Overlay are not subject to exemptions and require that you contact a Building Client Service Centre representative for specific information. If you are unsure that the scope of your project does not require a building permit please contact Building Code Client Service Centre or 3-1-1 for more information. You can also e-mail buildingpermits@ottawa.ca.